Today, I wanted to feature one of my favorite people – Julie DeJardin. I met Julie when I was working as a designer for Neil Kelly and she was the president for the National Kitchen and Bath Association. She’s an amazing designer, a dear friend and she really knows how to downsize in style! Julie recently moved into Portland’s beautiful high-rise – The Metropolitan. She loves her new space, the view and the ease of living in the Pearl District but the kitchen, well that had to change. Renown for her amazing culinary skills and love of entertaining, Julie quickly realized that her kitchen – the heart of her new home – simply wasn’t up to par. With the ease of an artist with a brush, she pulled out her measuring tape, a pad of paper and began re-designing the space. 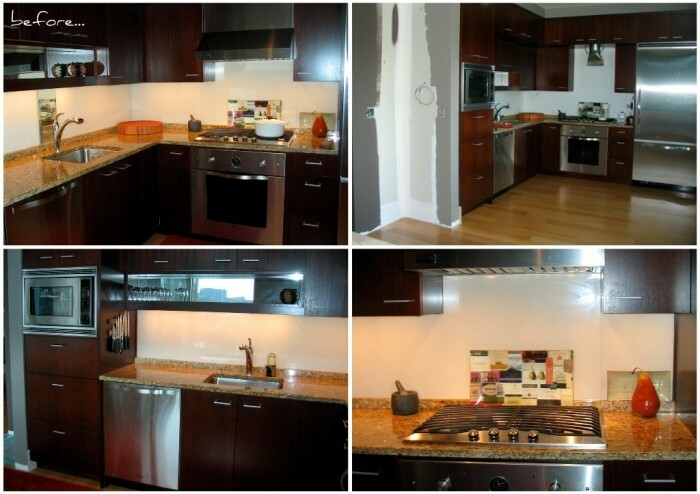 Check out the before shots…dull and dark. And after…modern, clean and fresh! 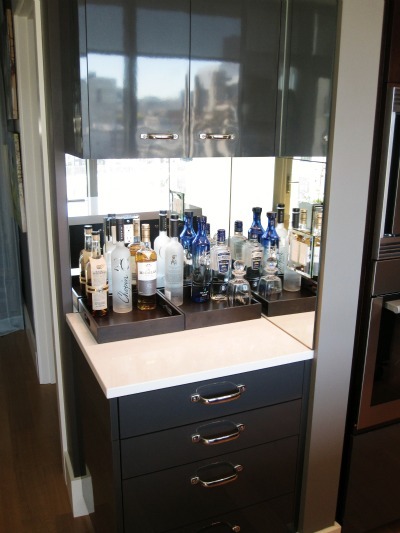 It would have been near impossible to match the wood tone of the current cabinetry, so Julie ingeniously added these stunning high-pressure Italian laminate cabinets in a stormy gray, to provide even more storage. By being creative with her space she gained a whopping 11.5 linear feet of base cabinet storage. Now everything is easy to find and easy to reach! 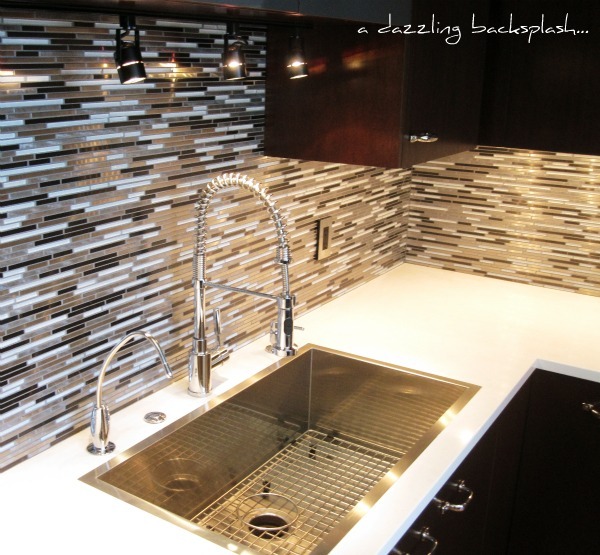 The sparkling back-splash is a combo of polished and brushed metals, interlaced with crystal clear glass. Sourced locally at Pental Granite & Marble. Gorgeous isn’t it? 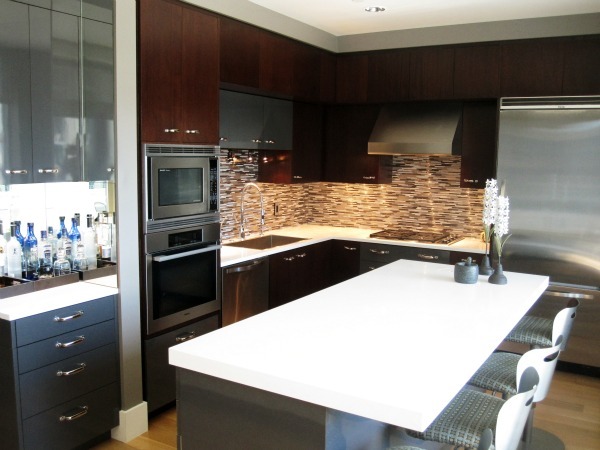 The snowy white Caesarstone Quartz counter tops provide the perfect contrast to the dark cabinetry. Think that island is just an island? Think again! Julie added casters to the unit, so it can be moved into different configurations to suit her entertaining needs. It’s a dining table, buffet, bar and workspace! How’s that for multifunctional design? By removing an existing wall, this elegant bar elongates the kitchen and adds sparkle and flair! Every girl needs a lovely place to whip up her favorite cocktail! Nothing but the best for Julie’s appliances – a Viking fridge, Miele oven, Wolf cook-top and a Blanco micro-edge sink, all make this kitchen perform like a pro’s. Not to mention that whipping up delicious meals with this view is simply inspiring. Julie’s artfully designed kitchen shows us, that when executed well, small spaces can truly meet all our needs! Want more inspiration? 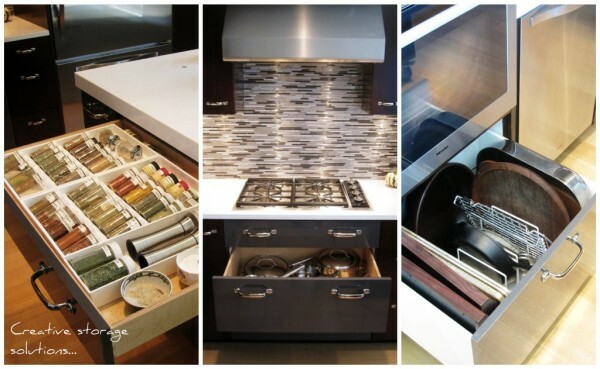 Check out some beautiful compact kitchen designs here. Does your kitchen meet the needs of your lifestyle? What would you change?